Seed collected in Sichuan Province, China during 1992 of Ceratostigma minus is providing colour in this warm, open November month. There is what may be signs of slight frost damage on the foliage but this does not detract too much from the welcome colour at this late stage of the season. This compact deciduous sub shrub was found growing on steep facing rocky hillside with an open aspect of the Ming River Gorge. 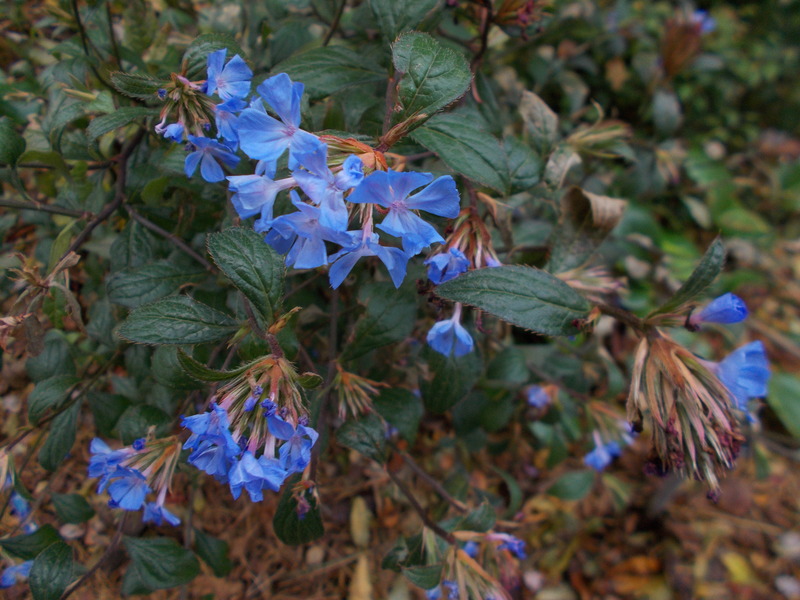 Fresh, intense blue flowers with pink blush markings on the petals. These terminate the season’s growth, those of a reduced size appearing from auxiliary buds on the stem. Held tight in a bundle with red bracts. Choose a site where the sun will ripen the wood to ensure flower production.